I am using a PS4 controller as an 'emulated Wiimote'. I can get everything working fine except for the right analog stick. I know a Wiimote+Nunchuck doesn't *have* a right analog stick, but a Wii Classic Controller does, and that's ultimately what I am trying to set up. I need it for camera tilt in games like Xenoblade Chronicles. I've posted a screenshot of my configuration. If anybody knows what I'm missing, I'd really appreciate some guidance. Thanks! Change the extension from Nunchuk to Classic (in the 5th column of the Wiimote window). 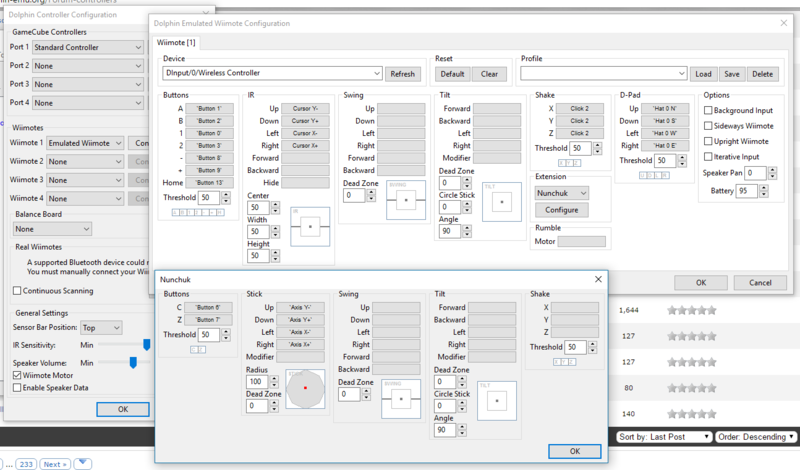 Then you can set up a Classic Controller by pressing the Configure button below the extension choice.